Adorn your side tables, coffee tables, mantlepieces and console tables with detail and beauty. A global inspired vase the Black African Ceramic Bottle Vase is perfect for displaying a single long stem floral or plants. The Black African Ceramic Bottle Vase features a curved bottle neck shape with engraved geometric lines on a black background. 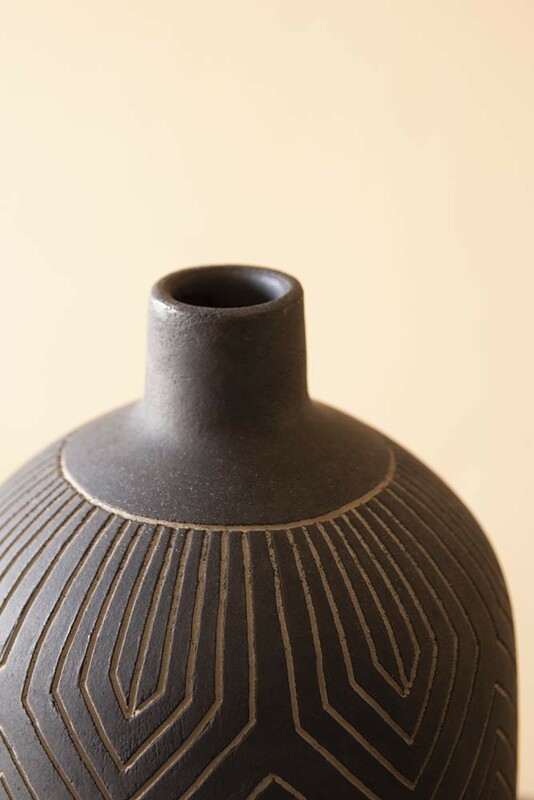 A ceramic bottle neck vase, the Stone & Black African Ceramic Bottle Vase measures 17cm in length x 17 in width x 32cm in height. If you are on the hunt for an earthy vase that will add rustic or boho eclecticism to your home interiors then this is the vase for you! Stunning irrespective of whether it’s filled with florals or not the lovely vase will seamlessly complement your interior design with its soft curves and muted colour palette. 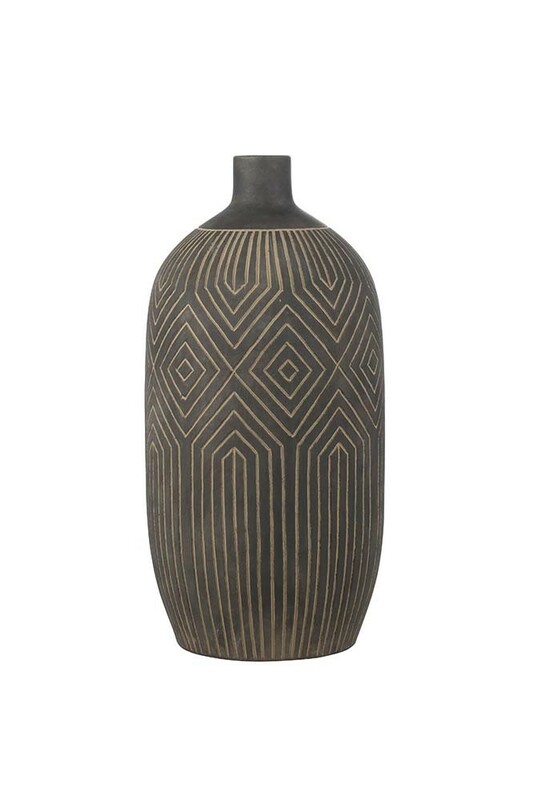 We think that this vase would make a lovely gift idea for anyone who loves global or ethnic inspired interiors. Vases can be styled anywhere in the home from the living room to the bathroom, they inject much important personality and wow-factor into your home interiors. 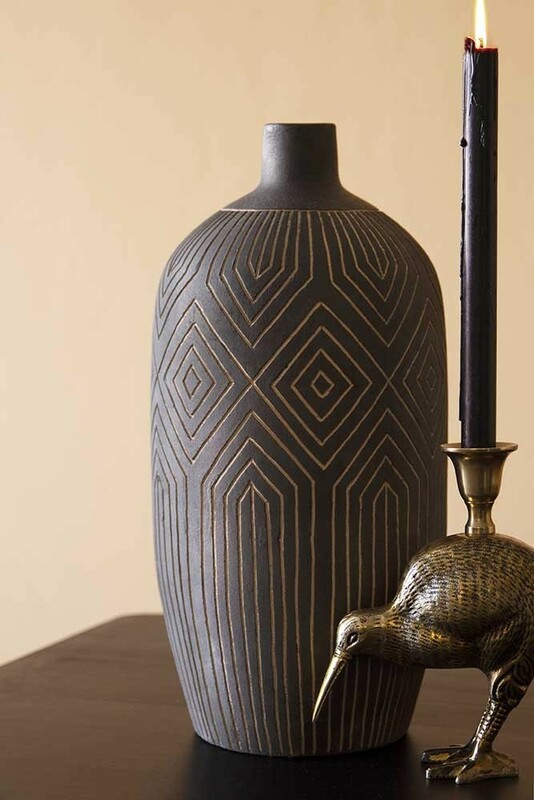 A beautiful piece the Black African Ceramic Bottle Vase would look best when styled with its matching partners the Black African Ceramic Chevron Vase and the Stone & Black African Ceramic Bottle Vase. The different shapes and complementary colours of the three vases will create impact in any room of your home.